DENVER - The Denver Business Journal recently announced nominees for its 2014 40 Under 40 award; making the list is Ethan Chumley, founder and CEO of Armstrong Steel Buildings. For the past 18 years, the Denver Business Journal has chosen 40 rising stars – each under the age of 40 – based on three criteria: business leadership, recognition of accomplishments and community involvement. Each criterion holds equal importance in the judging, so those who find success in their profession are not selected if they have not devoted a significant amount of time serving their community. Similarly, a prolific civic activist who is unable to show true professional accomplishment also fares poorly. 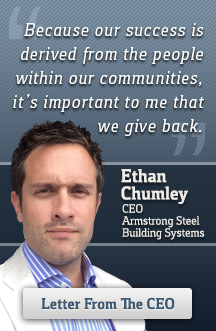 As founder and CEO of Armstrong Steel as well as the founder of Armstrong United, Armstrong's pending non-profit organization, Ethan Chumley meets the criteria for one of the coveted 40 awards. Under his direction, Armstrong Steel has grown to be one of the most recognizable and respectable construction companies in the nation. Ethan’s goal to reach out to the industry through marketing, partnerships and alliances, web development and strategic planning has resulted in several key partnerships within the construction industry and landed the company on Inc. Magazine’s Fastest Growing Companies list. Additionally, Ethan has been active in giving back to several community organizations including United Way, Denver Museum of Nature & Science, Children's Diabetes Foundation, Habitat For Humanity, Denver Botanic Gardens, Boys & Girls Clubs of America, Boy Scouts of America, the Denver Dumb Friends League, and Project Angel Heart. “In this day and age, it is important for a business leader who has seen the level of success I have seen to stay grounded. Sharing the monetary success with important organizations is only one way; I also volunteer my time and provide mentorship as much as possible,” says Chumley. The winners will be announced in the February 21 issue of the DBJ, honored at the annual luncheon March 20 and profiled in a special report publishing March 21. DBJ reports that judges received over 380 nominations for this year’s award, one of the highest numbers since the awards were first given in 1996.